I've attended yet another craft class! 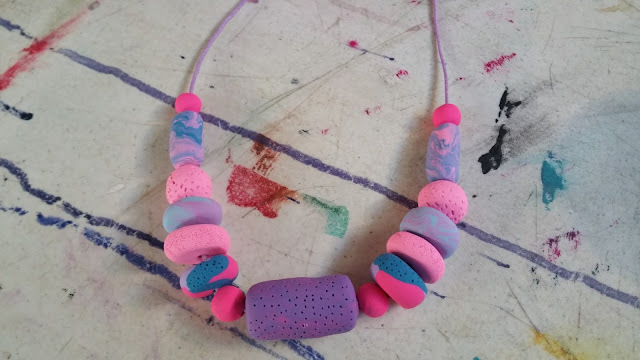 I'm sure the basics of making beads out of Polymer Clay is something that can easily be self-taught at home, but I love a class and embrace most opportunities to dabble in something new. And, like most crafty and arty endeavors it's not as simple as it seems! 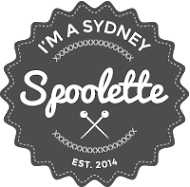 I took this class at Workshop in Redfern - a large workshop space (as the name suggests) that offers a variety of different workshops - crafty and otherwise. I wear a necklace every day so love the idea of being able to make my own, in colours that match items in my wardrobe. The class was really fun, and ran over three hours which is just long enough to get the basics covered. 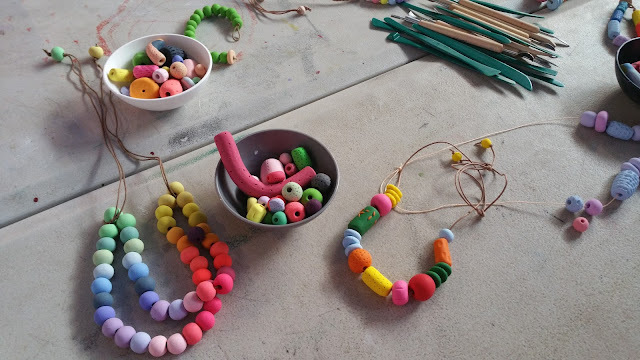 The class taught by Therese Lyons who runs Ena + Albert, an online treasure trove of all things polymer. Therese was a very lovely, patient teacher and seem genuinely impressed by some of the stuff we were turning out. 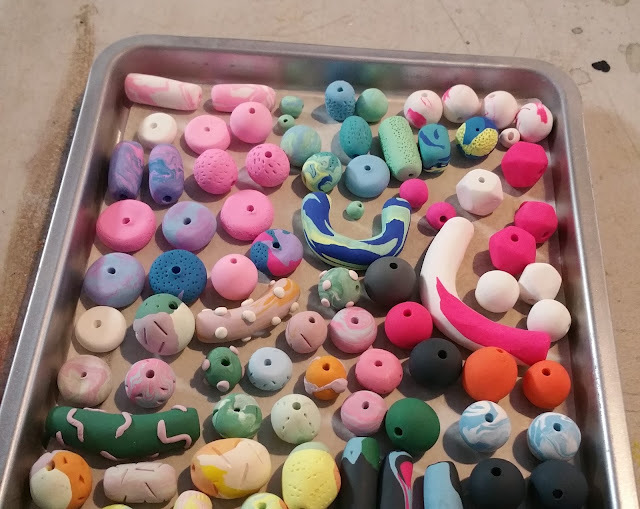 During the class we were taught how to condition the clay, about mixing colours and different colouring techniques, shaping the beads and how to add texture and marks to our clay. I love how the tray below highlights everybody's different creative take on the task at hand...we were all "taught" the same techniques but we all came up with something different. the tray of baked beads from my table - so pretty! ...and here is my creation below. It's quite...pink, which was not what I walked into the workshop intending to make. The pink just kind of happened all of its own accord. 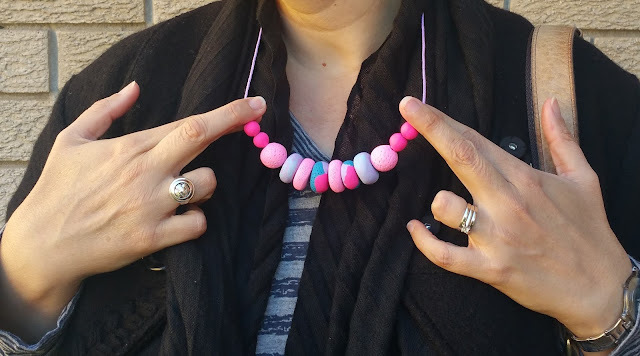 When I got home I decided that my necklace didn't look quite right, so I removed the big chunky bead from the middle and the two oblong beads towards the top...and now I LOVE it! I've worn it three times already, and in fact I'm wearing it at work today. I've made one attempt since the class at making my own beads at home and I have to say I found it really hard to narrow down an idea of what to make as the possibilities are literally endless! 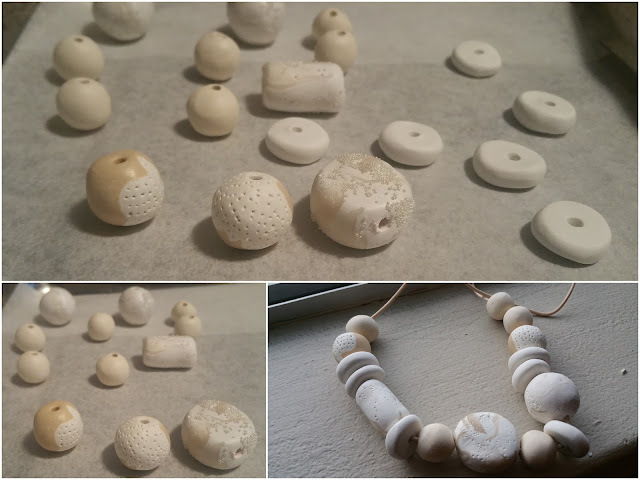 In the end I decided to "borrow" an idea from our teacher -- natural colours mixed with a translucent clay and microbeads. So...this is where years of practice obviously come in handy...a few of my beads cracked (I didn't let them cool before playing around with them), my microbeads all fell off and every bead is a different shape even when I intended quite a few to be the same. All that aside, it still looks quite good but it's a bit heavy for me (Iris Apfel I am not) so it's been gifted to a colleague who seems happy with it. I love the idea of being able to make beads to match things I am sewing. I have a black and white dress in the pipelines so I'm also thinking of jewellery ideas to go with it...something with red maybe?